Machine Range: 200 hg motor to 750 hg. 1. 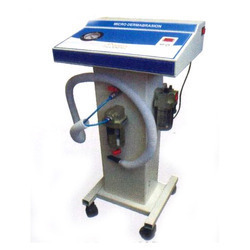 Oil free vacuum source fitted with zero maintenance free piston cylinder pump. 2. Compact & light weight, the unit cabinet is made of ABS plastic with handle for easy carrying. In the quest for youthful, vibrant skin, men and women share a common desire: to look their best, regardless of age. Microdermabrasion is a nonsurgical, noninvasive procedure that offers safe and controlled removal of the outer, dead layers of the skin. The remaining skin is more smooth, fresh and rejuvenated. 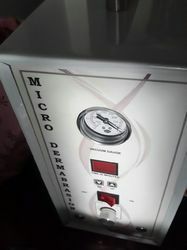 Diamond Microdermabrasion- Microdermabrasion + Jet Peel + Diamond Peel.